Not too long ago, I spotted nails I really wanted to recreate on @coewlesspolish Instagram. 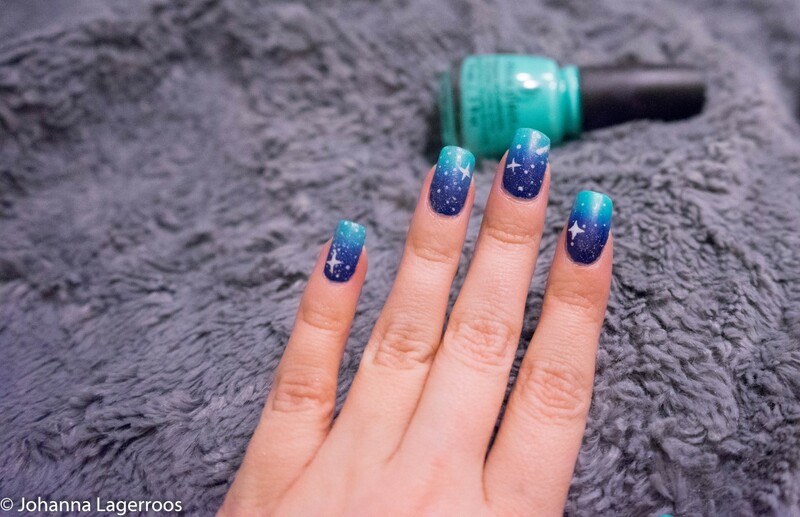 Eva is absolutely one of my favorite nail instagrammers, and while most of her designs are too detailed for me to do or even try to do past of them on my mani, this one here looked like something I could do a simple little version of. I must talk a bit about Eva's work before going into my recreation though. 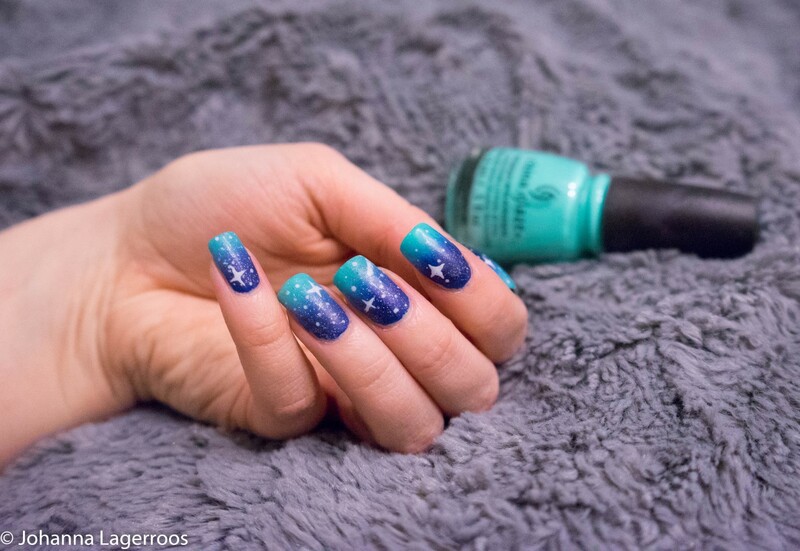 Eva is a Danish nail art lover with unbelievable talent when it comes to handpainting nails. Because as far as I know, she mostly paints all her designs by hand. And when you look her designs that will blow your mind because most of her work looks like mini paintings on her nails - like something you could print out and hang on the walls. She's so, so talented. If you love nail art and don't already follow her, go do that now. She more than deserves it. She also blogs some of her nails here, so you can add that to you reading list too while you're at it. I know she's so popular already that my tiny platforms aren't really shoutouts, but you know I love sharing things I love here. And her nail art isn't an exception. My version of the mani is a bit more simple and my turquoise is a bit more blue than Eva's, but as the point wasn't just copy but rather recreate it my way, I'm happy with the result. I used glitter to get more of the star detailing, I don't know if the original had a splatter technique for the little dots or what, it didn't say that in Eva's posts. It could as well be that she used a very tiny brush and dotted things on. 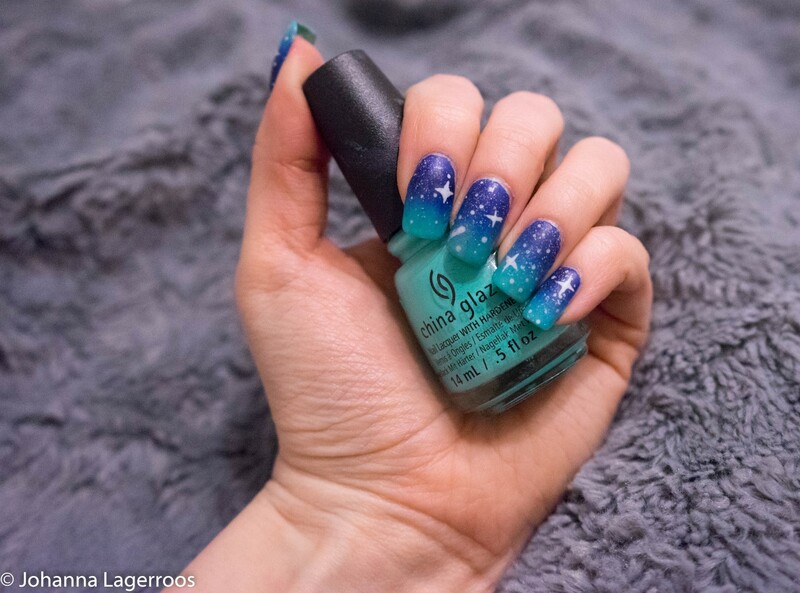 I just winged it and did something fun and night sky looking. The polishes I used for this were base coat, fast-dry top coat and matte top coat and Wedding Gown White by Glisten & Glow, and Too Yacht To Handle, Fairy Dust and Combat Blue-T's by China Glaze. The tools I used were a sponge, a thin nail art brush, dotting tool, clean up brush and liquid latex (to minimize cleanup needed). 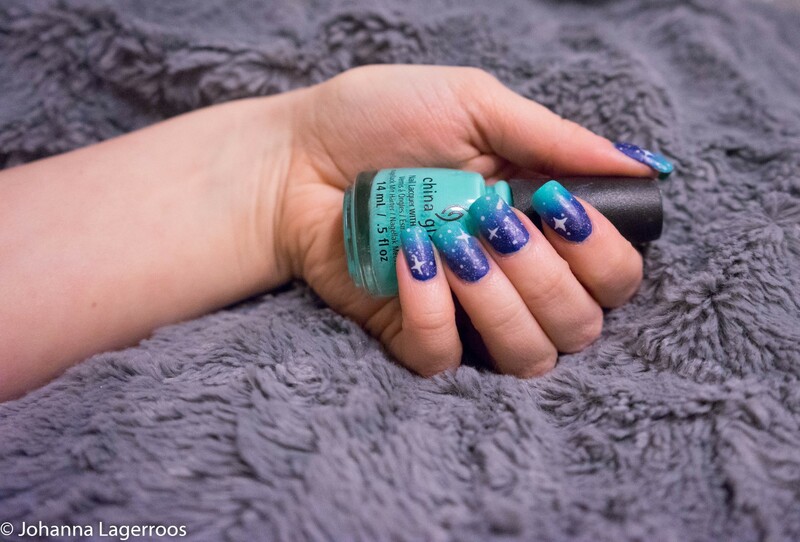 It was fun to create these nails, and sometimes when I lack of inspiration, it's nice to check through the nail art accounts on Instagram and find patterns, color combos and even whole manis to try. However, whenever I do use someone's design as inspiration, I do my best to mention who the original was so that the credit goes to the right direction. And also if someone is inspiring to me, they might be that for you so why would I keep that to myself? What do you think about this recreation? Let me know in the comments! That's all for today, I hope you enjoyed this little post here - the next one will be a bit longer one as we will be diving into another "1 Item, 5 Ways" posts. 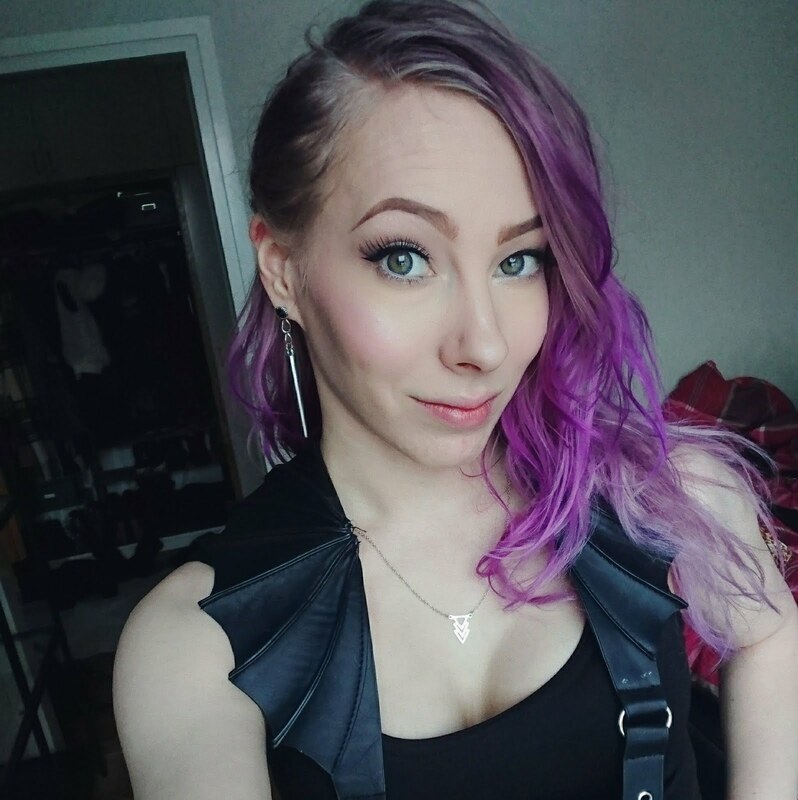 And I know I say this to you all the time but I really have posts that I'm very excited about coming up, and I think that the weather will soon allow taking pics outside as well so you will get other backgrounds than my bedroom wall, haha. If you have any post requests for the spring/early summer, feel free to leave them in the comments below!